Hollywood has never been shy of plagiarizing. Every idea, tale of cinematographic trick that made a splash somewhere – and is thereby a potential money generator – will get copied again and again. Every successful make gets a remake. And another one. In 2015 the promoting host of the Miss Universe franchise “misread” the name of the winner. He announced “Columbia” when the chosen winner was “Philippines”. After he few minutes he “corrected” himself. That “mistake” brought a lot of additional media attention – and financial value – to the event owner. The Academy of Motion Picture Arts and Sciences, the U.S. marketing and lobby organization of the movie makers, hands out some yearly rewards arranged to promote specific movies or persons in the movie business. The academy award ceremony is a rather boring event but it gets a lot of hype and media attention (and thereby generates lots of advertisement revenue). To further increase its value this years event plagiarized the idea of the Miss Universe promoters. One of the hosts announced the wrong winning movie for some category and then reversed himself to announce a different “real” winner. It was a “mistake” just as surely as Hollywood’s latest movie was a description of real life. One of this years prizes went to a fake “documentary” about a fake “rescuer” group which makes and distributes fake videos, staged photos and fake victims of the war on Syria. These al-Qaeda propaganda sidekicks, the White Helmets, are a British disinformation operation that is financed by more than $100 million of U.S. and UK taxpayer money. Its general task is to convince the “western” public that the war on Syria is justified because of the “cruelty of the Syrian government” which the fakes intend to establish in the mind of its consumers. Hollywood never was shy of taking government money to promote war on this or that country or “enemy”. The Pentagon’s liaison office in Hollywood finances many movies. If there are some tanks needed and military heroes in a script the Pentagon will organize the props, real tanks and soldiers, at no cost – provided of course that it can read and “correct” the script the way it sees fit. The makers of “Top Gun” need planes, air craft carriers and lots of explosions? No problem at all and at no costs to the producers. In exchange military recruitment staff will wait to trap moviegoers when they leave the theaters. Congress will happily pass the money for more useless planes. An Academy Award reinforces the message a production carries and gives the people behind the message additional value. 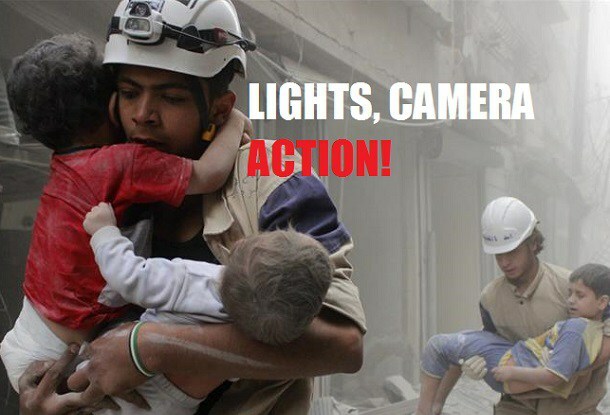 The marketing companies that create and run the “White Helmets” will surely receive a few extra millions for yesterday’s Oscar promotion. Hollywood is all fake. The wrong winner is announced and al-Qaeda gets an Oscar. “No harm done,” the promoters of such fakes might say. Except to the people of Syria. For them the destruction and death promoted by the fancy people in Los Angeles is all too real.